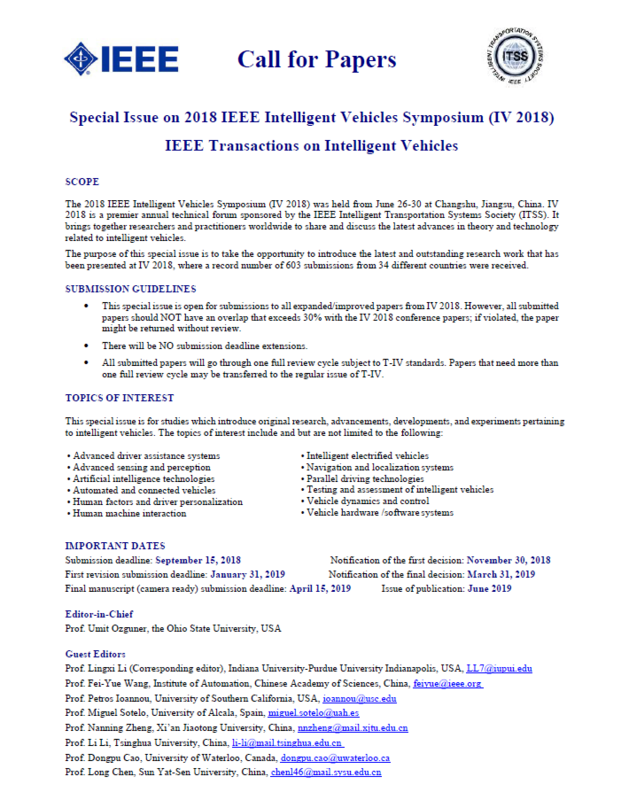 The 2018 IEEE Intelligent Vehicles Symposium (IV 2018) was held from June 26-30 at Changshu, Jiangsu, China. IV 2018 is a premier annual technical forum sponsored by the IEEE Intelligent Transportation Systems Society (ITSS). It brings together researchers and practitioners worldwide to share and discuss the latest advances in theory and technology related to intelligent vehicles. The purpose of this special issue is to take the opportunity to introduce the latest and outstanding research work that has been presented at IV 2018, where a record number of 603 submissions from 34 different countries were received. • This special issue is open for submissions to all expanded/improved papers from IV 2018. However, all submitted papers should NOT have an overlap that exceeds 30% with the IV 2018 conference papers; if violated, the paper might be returned without review. • There will be NO submission deadline extensions. • All submitted papers will go through one full review cycle subject to T-IV standards. Papers that need more than one full review cycle may be transferred to the regular issue of T-IV.